Converting PDF, EPS, Adobe Illustrator, and Microsoft Office items to native QuarkXPress items highlights this fast, stable upgrade. You have to hand it to Quark: every few versions they add a major new capability that has never existed in any program before. With QuarkXPress 2016 they’ve added the ability to—cue drum roll, please—convert imported PDF, EPS, and Adobe Illustrator files to native editable QuarkXPress objects. You can even convert objects or entire pages from Adobe InDesign, Adobe Illustrator, Microsoft Office (including Word, Excel, and PowerPoint), CorelDraw, Affinity Designer, and other apps. QuarkXPress 2016 has other innovative new features, many of them based on requests from users. QuarkXPress 2016 is also impressively fast and stable, and those upgrading will be delighted that XTensions written for QuarkXPress 2015 also work with QuarkXPress 2016 (as long as the XTension doesn’t conflict with a new function). And unlike Adobe InDesign, QuarkXPress doesn’t require an ongoing subscription. Its perpetual license lets you use the program forever. Surprisingly, it takes only a few seconds for QuarkXPress 2016 to convert every object in a PDF, EPS, or Adobe Illustrator file to a native QuarkXPress object. You don’t have to convert an entire document; if you import the file into a QuarkXPress picture box and crop it, only the area showing in the box will be converted. You also have the option of keeping the original picture box intact and converting a copy. The importance of this capability cannot be overstated. Designers often work with charts, graphs, and PowerPoint slides that almost never use the correct colors or fonts for a company’s brand. Conveniently, when these items are converted to native objects in QuarkXPress 2016, their colors are added to the Colors palette where they can be replaced all at once with your brand-approved colors. The text in these graphics is also converted to native QuarkXPress text, so you can easily format it to match the brand by using Style Sheets. After converting, vector graphics become native QuarkXPress objects and Adobe Illustrator paths become QuarkXPress paths with the exact same Beziér anchor points as in Illustrator. You can then use the Beziér (pen) tools in QuarkXPress to adjust them. Here’s one timesaving use for these conversions: Publications almost always receive advertisements in PDF format, and once they’re converted to native QuarkXPress objects, the publication can update prices, dates, and colors inside the ad. That’s never been possible in a page layout program before. To test QuarkXPress’s ability to convert a wide variety of files, I scavenged up the most complex files I could find, dating back to the early 1990s. Unbelievably, every EPS, PDF, and AI file converted perfectly and within seconds. However, any fonts used in these files need to be active on your computer, or else QuarkXPress displays its “missing font” dialog. (If you subsequently activate those fonts, the document displays normally.) Unfortunately, sometimes when converting PDF files each line of text ends with a hard return that may need to be removed before editing the text. That’s a limitation of how the PDF was originally generated. The magical conversions continue: You can copy objects from many other applications and paste them into QuarkXPress as native QuarkXPress objects, including Adobe InDesign, Illustrator, CorelDRAW, Affinity Designer, Word, Excel, PowerPoint, and Apple Pages. And yes, you can successfully convert an entire InDesign page to QuarkXPress. In my testing, every object or group of objects I copied from Adobe InDesign and Illustrator, Microsoft Word and Excel, converted to native QuarkXPress items flawlessly. PowerPoint slides converted well, but each line of text became its own box. Graphics from Apple Pages converted as expected, but text lost its formatting. To maintain the formatting, Quark recommends exporting the document from Pages as a PDF file and then converting the PDF file in QuarkXPress. This ability to convert objects from other applications opens a whole new world of graphic possibilities. For the first time, you can use the Smart Art tools in Microsoft Office applications to create flowcharts and then fine-tune them in QuarkXPress. Same for charts and graphs in Illustrator, CorelDraw, or Microsoft Office. This could fundamentally change the relationship between corporate chart producers and page layout artists. While InDesign can convert a native Adobe Illustrator file into native InDesign objects (it can’t convert PDF or EPS), the resulting text frames are broken up and difficult to use. In contrast, QuarkXPress 2016 converts the objects exactly as they were in Illustrator. The example below was created in Illustrator, then imported and converted to native objects in InDesign and QuarkXPress. A product label in Adobe Illustrator (top), converted to InDesign (center) and converted to QuarkXPress (bottom), with text objects selected. Click to enlarge. In QuarkXPress 10, Quark replaced the on-screen rendering engine and the results are far more accurate than what you see in Adobe InDesign, Illustrator, or other Adobe apps. The difference is very clear now that the user can convert those documents into QuarkXPress. 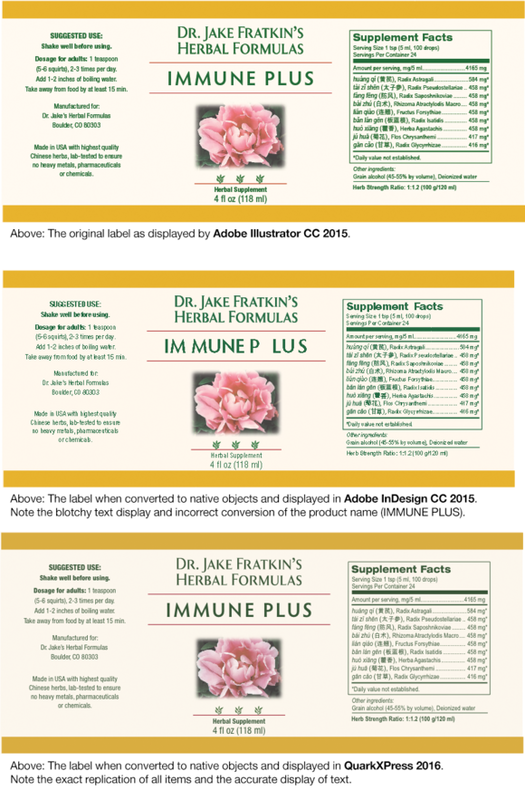 Below is a product label that was created in Illustrator, then imported and converted to native objects in InDesign and QuarkXPress. 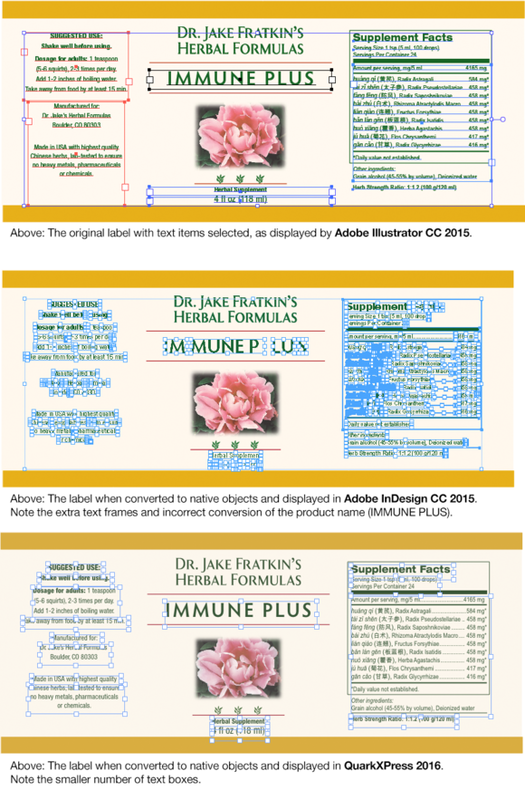 A label in Adobe Illustrator (top), converted to InDesign (center) and converted to QuarkXPress (bottom). The difference in display quality is obvious. Click to enlarge. HTML5 is the language of modern websites, ebooks, and some mobile apps. QuarkXPress 2016 can export anything you create (or convert) to an identical version as an HTML5 publication. This means you can export a reflowable ePub, a fixed-layout ePub file, or a web version of your document with one or two clicks. The HTML5 palette in QuarkXPress 2016 lets you add interactive behaviors to page items. Perhaps most interestingly for publishers, you can create a Scroll Zone that displays only a portion of the content of a text box, but then the user can use scroll bars attached to it to view the rest of the story. And for the first time, HTML5 now allows almost every typographic trick in QuarkXPress, including runaround text, justified and hyphenated text, vertically justified text, text indents (indent here and discretionary returns), text color opacity, text aligned with baseline, outline and multi-level bullets and numbering (in Fixed Layout ePubs), custom kerning and tracking, tabs and tab stops, fractions and prices, and native “popup” footnotes (in Fixed Layout ePubs). It’s important to remember that QuarkXPress offers two kinds of HTML5 export formats: EPUB and HTML5 Publication. EPUB is for documents intended to be read on eBook readers such as the Kindle or iBooks on your Mac or iOS device, while HTML5 Publications are read inside a browser. HTML5 Publication is best used for brochures, interactive content marketing pieces, catalogs, and perhaps magazines. If you add interactivity, they can feel like an app, but you have to host them on your own web server. 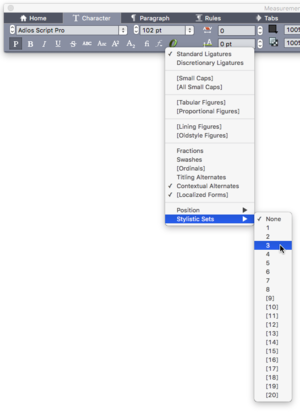 The OpenType options in QuarkXPress are one click away in the Measurements palette. QuarkXPress now gives you access to Stylistic Sets in the Measurements palette. Click the green O to see them. (First, choose an advanced OpenType font, which often has “Pro” in its name.) OpenType options in QuarkXPress are far more convenient to use than those in Adobe’s products, which are squirreled away in a submenu of a panel’s tiny fly-out (side) menu. Formerly an XTension, the new Color Picker lets you click on any item (including imported pictures) to add new color swatches to your layout. Logically, it’s located at the bottom of the Colors palette. Color blends can now include multiple colors, each with varying levels of tint and opacity. 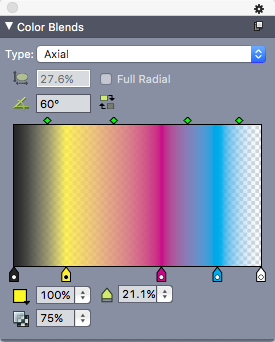 Blends (gradients) in QuarkXPress 2016 can now include more than two colors. Each color can have a different level of opacity (transparency) and tint, and you can adjust them with sliders or by typing in values. A common complaint from designers is that the items in palettes and panels are too small to see, especially on smaller screens with high resolutions. Quark has begun to address this issue with an optional 50 percent larger size for the icons and text in the Measurements palette, which is by far the most used palette in QuarkXPress. You can now pinch, zoom and rotate items using gestures on your Mac’s touchpad. Quark finally added a Fit Box to Text feature, so that if your text is shorter than the box, or if it overflows the box, the box will resize to fit the text. This feature even balances text in boxes that have multiple columns of text. As you drag an item, indicators conveniently appear to show you its spacing in relationship to other items. This makes it easy to align and uniformly space items. In QuarkXPress 2016, guides now appear that show when the edges and centers of text columns and gutters align with other items, even in multi-column text boxes. The Find/Change feature now remembers your most recent searches and allows you to search for nonbreaking spaces and characters. Content variables can now wrap onto multiple lines just like regular text, which is useful for longer headers and for created/modified/printed slugs. Print experts will appreciate support for ICCv4 color profiles. Another feature from InDesign I’d like to see in QuarkXPress is multi-place: the ability to load the cursor with multiple graphics files and then click to import each one. In light of QuarkXPress 2016’s new ability to convert PDF files to native objects, being able to quickly import each page of the PDF could save time. QuarkXPress 2016’s new ability to convert objects and pages from other programs makes this version a vital upgrade for any user. The ability to export HTML5-based publications with interactivity will make modern publishers happy, and the dozen or so smaller improvements add efficiency to an already fast and efficient program. QuarkXPress 2016’s new ability to convert objects and pages from other programs makes this version a vital upgrade for any user. Performance is fast and stable.